Port Alberni, B.C. - Hammer's Bulldog Blog: MONSTER POSTING. 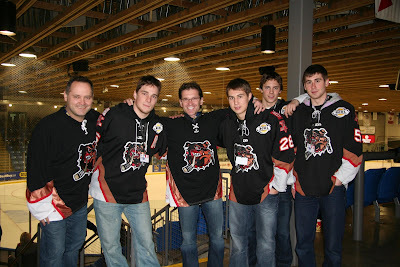 BCHL All Star Game in Vernon (In Nanaimo next year? ), Minor Hockey Update, Kraft HockeyVille Update, Angel update. MONSTER POSTING. BCHL All Star Game in Vernon (In Nanaimo next year? ), Minor Hockey Update, Kraft HockeyVille Update, Angel update. Well, once and for all it has been settled! The Coastal Conference is vastly superior to the Interior, with a 13-5 win last night in Vernon. Oh wait, it was just an All-Star game and it meant nothing? Drat. Well done Ryan. However - I think the rivals in the Coastal Conference hate each other just as much as the guys in the Interior do. Too bad that the Bulldogs won't be hosting. I'm not sure how the actual process works and if the Dogs have even attempted to host this event. It would certainly be cool if it did come here one day. I guess for now hockey fans here will have to settle for International events, with week long National TV Exposure on SHAW TV and TSN. Speaking of TSN...Huge thanks to Gary for sending me this cool picture of TSN play-by-play voice Dave Randorf and Director Andy Bouyoukos taking some time to pose for a cool pic with the Bulldogs. 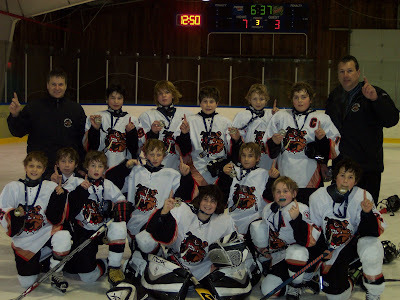 The Alberni Valley PeeWee Bulldogs traveled to Sooke to partake in a tournament on December 27-29th. The PeeWee Bulldogs dominated in round robin play and found themselves playing the hosting team Sooke Thunderbirds for the Gold Medal. The round robin game between these 2 teams was a Port Alberni win of 5-3. Bulldogs knew that they would have to work hard if they wanted to bring home the gold medal and thats what they did as they skated home with a 7-3 win and big shiny gold medals going all 5 games in the tournament undefeated. The Alberni Valley's local PeeWee Bulldogs Team is currently in 1st place in the league standings, and they continue to work hard at their goal of winning the Tier 3 banner! Their goal got closer on the weekend as the Dogs hosted rivals Nanaimo Clippers on Saturday, and skated away in a 3-3 tie. Next up on Sunday, the dogs hosted another very important game -vs- the Juan De Fuca Grizzly's, who is the only team to hand the PeeWee's their only league loss. The Dogs knew they would have to outplay JDF in which they did in order to win a close 4-3 game. Last game of the season for the PeeWee's is this upcoming weekend -vs- Sooke Thunderbirds. A win from the PeeWee Bulldogs will see the locals win the Vancouver Island Tier 3 Banner that would hang high in the rafter's at the multiplex. 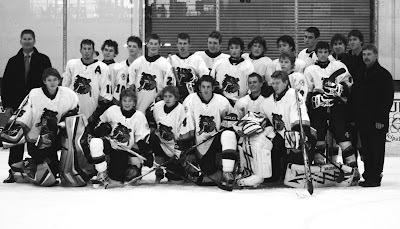 Come out to cheer the bulldogs on at the multiplex Saturday January 17, @ 12:45! Coach's are very proud of this small, fast, defensive, young hockey team, which consists of only 2 returning player's from last year. This is the first year of full contact hockey for most of our team, and they have improved at all the goals that were set in place for us as a team. We have very solid, consistant, goaltending which has shown in our league play too! The AVMHA Midget A Bulldogs tuned up with a couple of close Tier 1 games this weekend after three weeks off the ice during the U-17 World Hockey Challenge. With Ryan Campbell and Luciano Somerville back from injuries it was the first time the team played with a full roster since early in the season. On January 10 in Nanaimo they played 52 minutes of disciplined fast hockey during which the Bulldogs skated faster, passed better and hit harder than their bigger opponents. Alberni defence limited the number of good opportunities and Matt Larose was solid in turning away most of the others. Unfortunately, although there were a few good chances at the other end, including a couple off the posts, none of them found their way into the Nanaimo net. A flukey goal in the first minute and a third attempt over a sprawling Larose with two minutes to go were enough to let Nanaimo get away with a 2-0 final. On Sunday at home they played well again against Cowichan. After a scoreless first period, the visitors got on the board first at the start of the second, the went up by two at the eleven minute mark. Within seconds Darrin Oscienny combined with Catlin Macleod to close within one. It was nearly 20 minutes until the next goal. Luciano Somerville and Leo Fitzgerald set it up for Myles Fitzgerald to tie the game. Cowichan got the game winner on a power play goal at 9:26 of the third period. Coach Demerais said the team played well considering their long lay-off and should be warmed up for the tournament next weekend. The team goes to the Kamloops MHA Argo Road Warriors Tournament January 16-18. In Kamloops they will open in a pool with teams from Kelowna, Quesnel, Abbotsford and Peninsula. 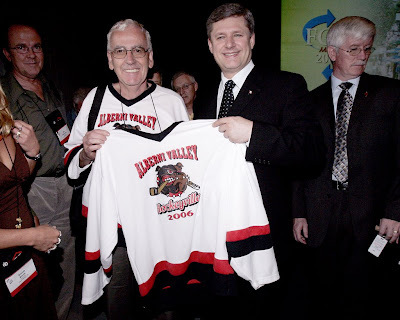 Toronto, ON – January 14, 2009 –Ten communities have been selected from over 7,100 nominations to proceed to the next phase of Kraft Hockeyville 2009. CBC’s Ron MacLean and Cassie Campbell announced that Harbour Grace, NL; Stanley, NB; Acton Vale, QC; Thetford Mines, QC; Woolwich Township, ON; Lincoln, ON; La Broquerie, MB; Terrace, BC; Penticton, BC and Humboldt, SK will now compete for the coveted Kraft Hockeyville 2009 crown. These ten communities now enter a knock-out phase as Canadians from coast-to-coast vote for their favourite hockey-crazed community. Canadians can vote by visiting CBCSports.ca/hockeyville, via telephone by calling 1-866-533-8066 or by texting (text VOTE + community name to 222111 – Standard text messaging rates apply to all texts sent and received in connection with voting. Text voting is limited to people 13 years of age and older). Voting is unlimited but will close on January 18 at 11:59 p.m. EST. The first of the top five communities will be revealed on CBC’s HOCKEY NIGHT IN CANADA on January 25 during its NHL® All-Star Game broadcast, beginning at 6 p.m. ET. The Alberni Valley Bulldogs “Heart of an Angel” Campaign continues to run during each home game this month so please remember to stop by, say Hi to Angel, and purchase a heart for a minimum $2 donation. Through your donation you can help make an incredible difference in the life of a Variety Child and their family. Donations to the Coin Drive can also be dropped off at the Variety table during the game.